Whenever you buy a car and drive it off the lot, it instantly depreciates. The newer the car, the greater the depreciation. The fact that your car is immediately worth less than you bought it for creates a problem when you consider your insurance coverage. Your insurance company only covers your car up to its total value. So, in the event of a total loss, there is the chance that the amount that you owe on your car is more than the amount of your car’s value. This is especially true if you are in a car accident soon after making your car purchase. So, if you owe $20,000 on your car, but it is only valued at $15,000, if your car is totaled you will only receive the $15,000. That means that there is an extra $5,000 that you have to cover. Your loan won’t be entirely paid off and you’ll be without a car. This is where GAP insurance comes in. GAP stands for Guaranteed Auto Protection or Guaranteed Asset Protection. This type of insurance is designed to bridge the gap between what you owe on your auto loan, and your car’s value. You don’t have to get GAP insurance, but some states require that car dealerships and financiers offer you the option of GAP coverage. There are some that might actually require GAP coverages. Some finance companies want to know that you are going to pay off the loan, even if the car is worth less than you owe, and it is totaled. Some leasing contracts also require GAP insurance, just in case. Loan term of more than 60 months. In all of the above situations, there is a good chance that your car will depreciate quickly to the point where you owe more than the car is worth. A long loan term means lower payments, and more of those payments going toward interest, rather than paying off the principal. Anytime you have low down payment — or no down payment — you are financing such a large portion of the car that it’s value is almost certain to plummet below what you owe as soon as you drive away. 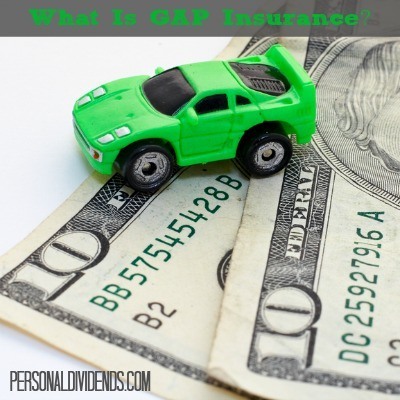 The GAP insurance premium is usually only paid once, up front. Check the policy information to make sure you understand the caps on coverage, and other items that might affect your payout. But Do You Need GAP Insurance? GAP insurance can be somewhat costly — especially if it is wrapped up in the cost of the loan. In some cases, you can add GAP insurance to the loan, and in that case you end up paying interest on your premium payment. This makes the whole purchase even more expensive. However, if you are concerned that your car will be totaled, you might want to pay for GAP insurance if your car’s value isn’t like to hold. On the other hand, if you have good-sized down payment, and a short loan term, you probably don’t have to worry about GAP insurance. Chances are that, even with depreciation, your car will still be worth more than what you owe on it. I smell a racket. 🙂 Owning a car is old school anyway–join a carsharing organization or two, get a bike and a monthly transit pass, enjoy the physical and mental benefits of walking, and forget about car insurance!